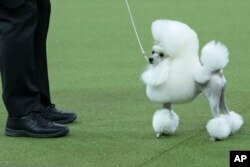 America’s top dog is a bichon frise. 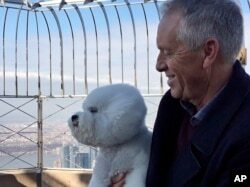 Flynn the bichon frise was named Best in Show at the Westminster Kennel Club Dog Show Tuesday night. The choice surprised just about everyone watching. The Associated Press reported that people who had been loudly shouting for their favorite dogs became silent when a judge announced the winner. Flynn beat out several other dogs to capture the prize. They included Ty the giant schnauzer, Biggie the pug, Bean the Sussex spaniel, Lucy the borzoi, Slick the border collie and Winston the Norfolk terrier. The kennel club says the bichon frise is known as good animal for companionship. This breed of dog came from the Mediterranean area. During Europe’s Renaissance, painters often included them in their works. The breed was brought to the United States in the 1950s. Flynn has been unable to rest after his victory in New York City’s Madison Square Garden. Flynn and his Westminster-winning team receive no prize money. Instead, he gets a shiny bowl and the team can earn money from breeding fees. The Westminster Kennel Club started in 1877. The organization gets its name from an old hotel where men gathered “to drink and lie about their shooting accomplishment.” From one of the gatherings, they had an idea to set up a dog show to compare their dogs. 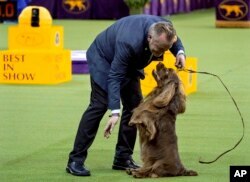 The 142nd Westminster event attracted 2,882 entries in 202 breeds of dogs. Ben Walker reported this story for the Associated Press (AP). Hai Do adapted the report for VOA Learning English. His story includes information from the Westminster Kennel Club. George Grow was the editor.